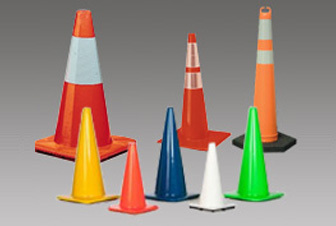 Parking cones, also referred to as traffic cones or road cones come in several sizes and have many uses. They range from 4 inches to 42 inches in height. The most commonly used parking cone sizes are the 28″ traffic cone and the 12″ traffic cone. Traffic cones are very durable so they can withstand impact with cars and weather. Parking cones can be used in construction zones for diverting traffic, for dividing lanes or used as parking devices. For use in construction zones and other traffic control, the 28″ traffic cone is generally the best choice because of their greater height and visibility. For city streets, the minimum acceptable height for traffic cones is 18 inches. 12″ traffic cones which are often used for in parking lots, for marking off play areas for kids, or as temporary barricades in indoor settings. The smaller cones like 6″ parking cones are often used in sporting events. Cones that are to be used in night settings must have a reflective collar. If you have further questions about the proper size or type of traffic cone for your event or job, please contact us. The spring and summer seasons are also road construction seasons and keeping workers safe is high priority. Many people have questions about which safety wear is needed for what jobs and what requirements the safety wear needs to meet. ANSI/ISEA is a voluntary industry standard which specifies the requirements expected for high-visibility safety wear for construction workers, utility workers, landscaping, and fire fighters. There are many different types of safety wear including safety headware, safety vests, safety pants, jackets and shirts. 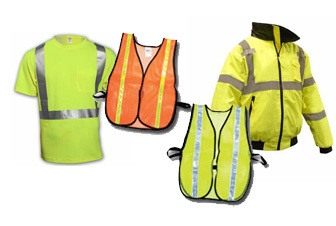 Depending on the type of work being performed, persons in construction or otherwise high traffic areas should be aware of the the three levels of high visibility apparel standards. Class 1 Safety Wear: Appropriate where there is plenty of separation of workers from vehicle traffic and where the work area is not complex. Additionally, traffic speeds are not expected to exceed 25 mph in these areas. This class of safety wear are often seen on parking service personnel, warehouse staff, and those doing shopping cart or sidewalk maintenance. Class 2 Safety Wear: Appropriate when work activities take place closer to traffic and where these activities may divert worker attention from approaching traffic with speeds exceeding 25 mph. The Class 2 safety apparel is often seen in greater than 25 mph construction zones, parking and tollway personnel, school crossing guards, airport grounds personnel and those directing traffic. Class 3 Safety Wear: Appropriate for workers who are exposed to higher vehicle speeds and/or reduced sight distances. The worker must be visible throughout body movement and must be identifiable as a person at a distance of 1,280 feet away. These garments provide the best visibility with lots of extra reflective surface and they must have sleeves with retroreflective material between the shoulder and arm to make movement more noticeable. These are often used by railway workers, roadway construction staff, vehicle operators and accident site investigators. There are several different colors to choose from when it comes to safety wear. The flourescent yellow green is thought to be the most visible color for dusk and dawn when there is less light. It can also provide some contrast for those in work zones with orange traffic cones and safety equipment. The flourescent orange color is also a very popular color and has good contrast for areas that have more foliage. This is typically the safety color in work zones. However, if you are trying not to blend in with a plethora of other orange safety equipment then as stated above, the flourescent yellow green may be a better choice. If you still have questions about which safety apparel to order, give us a call at (877) 966- 1018 and we can help answer your questions.